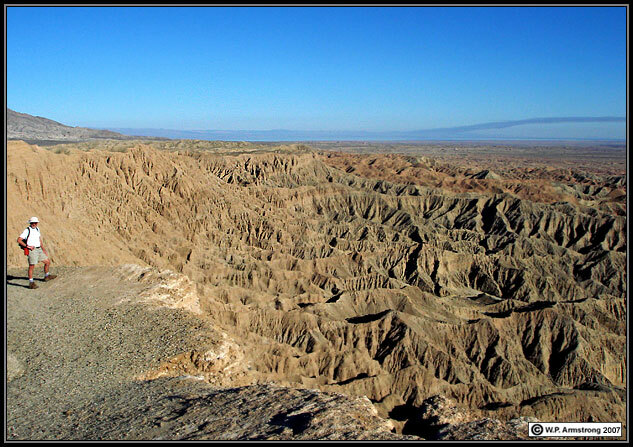 View of Badlands from Fonts Point. Swollen stems of Eriogonum trichopes. 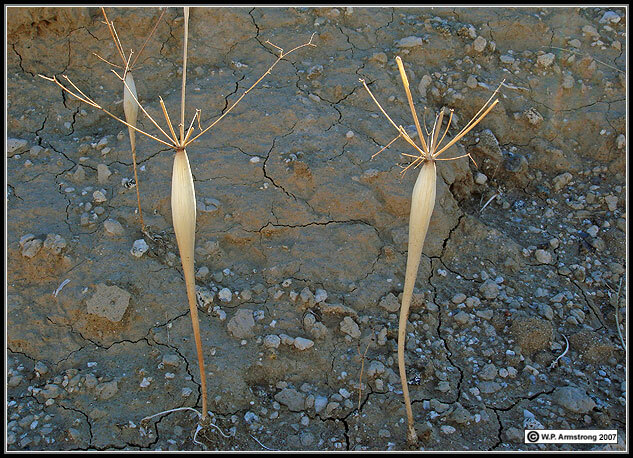 I previously identified these as desert trumpet (E. inflatum var. inflatum); however, careful examination by Tom Chester revealed that they are the annual E. trichopes with swollen stems. 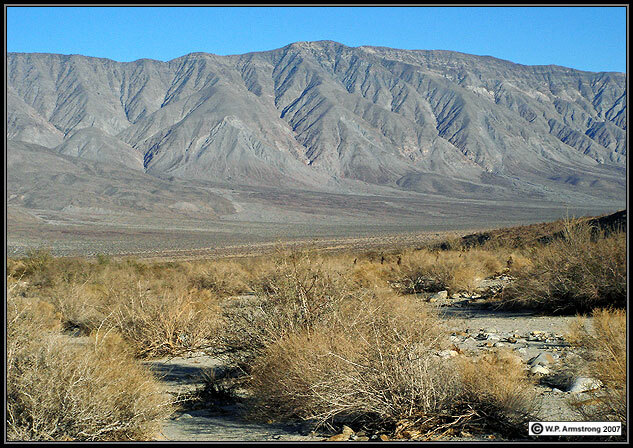 According to the Terrestrial Vegetation of California (3rd Edition): These mud hills are composed of erosive, loose, powdery silt that may be high in gypsum, and they are famous for generating the lowest water potential and highest salinity of any soils in North America. Most of the surface is unvegetated except for specialized ephemerals such as inflated Eriogonum trichopes. Gypsum-tolerant perennials such as Nicotiana obtusifolia and Argemone munita may occur here, as well as the salt bush Atriplex hymenelytra. 1. Athough many wildflower books and floras list inflated and deflated varieties of desert trumpet, this may be incorrect according to A.M. Stone and C.T. Mason, Jr. (Desert Plants, 1975). Stone and Mason studied wild and greenhouse populations of both varieties, and discovered that stem inflation was caused by larval feeding of gall insects, including a lepidopteran (Pyralidae) and a beetle (Mordellidae). According to Stone and Mason, the swollen tissue is produced in response to a chemical or physical irritation by ravenous insect larvae imbedded in the plant's tissues. They concluded that "the taxonomic recognition of the varieties "inflatum" and "deflatum" is not based on a genetic characteristic, but on a monstrosity, and has no validity." 2. According to the world authority on the genus Eriogonum, Dr. James L. Reveal of the University of Maryland (personal communication, 1998), the swollen stem of E. inflatum var. inflatum is due to high concentrations of carbon dioxide (CO2) in the solid stem and seems to be related to gas regulation. Although some insects utilize the swollen stem as a larder, the inflation is NOT caused by the larval feeding of gall insects. In fact, during very dry years many populations of var. inflatum will have no or poorly inflated stems. 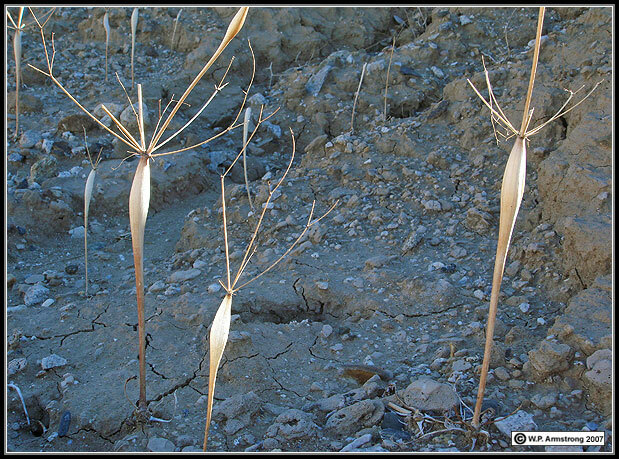 In northeastern Utah and adjacent Colorado, another species E. fusiforme occurs in the tens of millions in a good year, and all have inflated stems even when they are young (and there is no evidence that the inflated stems are caused by insects). The above image clearly shows that E. trichopes can also be added to the list of wild buckwheats with inflated stems. 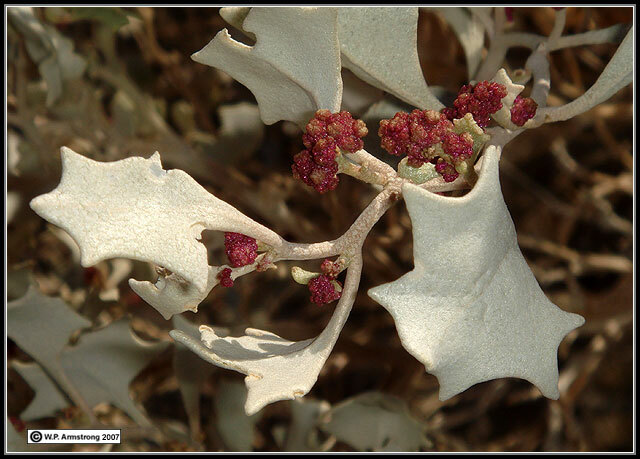 Desert Holly (Atriplex hymenelytra) showing silvery leaves and pink flower buds. An assortment of winged, one-seeded fruits (utricles) of saltbushes (Atriplex) from the Mojave and Colorado Deserts of the southwestern United States. Saltbushes belong to the goosefoot family (Chenopodiaceae). 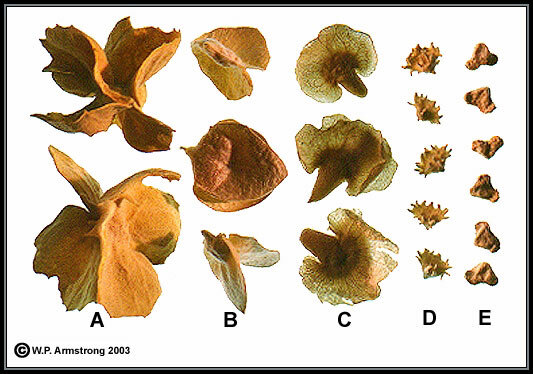 From left: (A) A. canescens, (B) A. confertifolia, (C) A. hymenelytra, (D) A. polycarpa and (E) A. parryi. The most notable wind-blown species is (A) A. canescens, appropriately named the 4-wing saltbush. 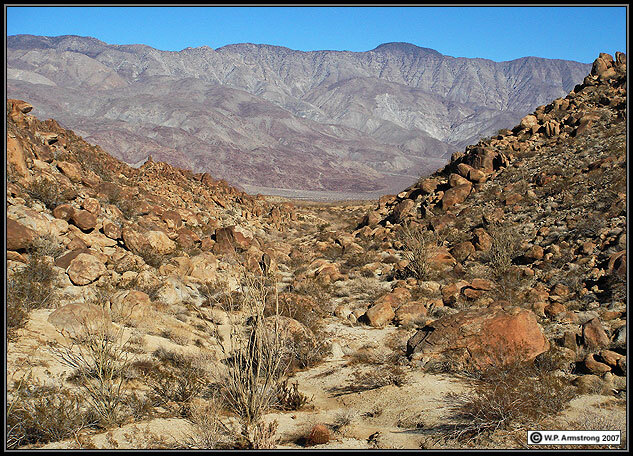 Arid desert regions throughout the world where vegetation is sparse sometimes develop specialized communities of cyanobacteria, mosses and lichens. 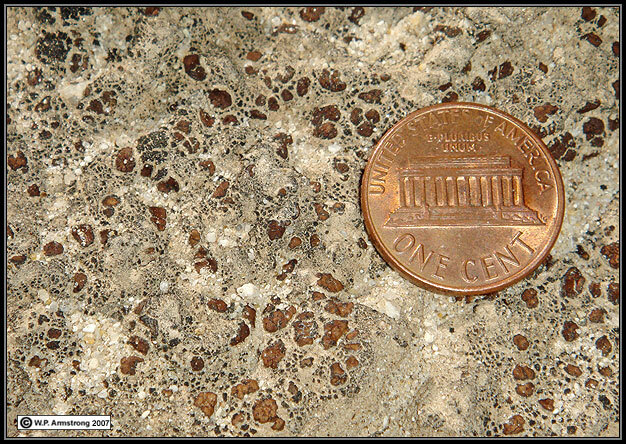 The surface soil is held together by these associations called "cryptobiotic soil crusts." These crusts are very fragile and are easily damaged by walking on them. 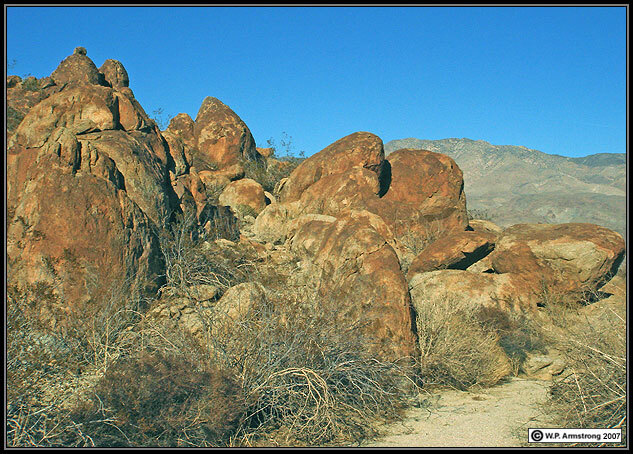 In Anza-Borrego Desert, two of the components of this association include the soil lichens Placidium lacinulatum and Psora decipiens. 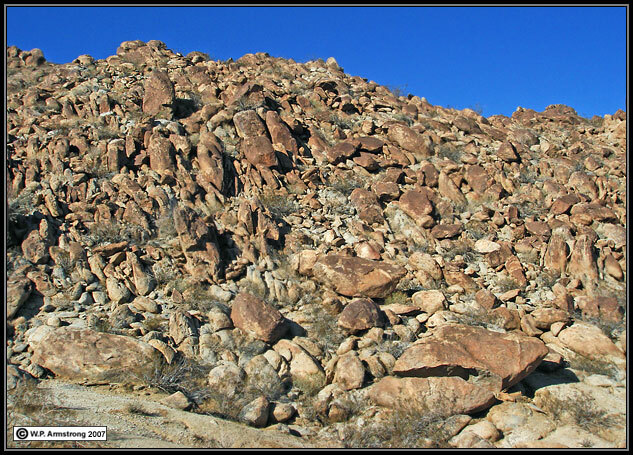 The desiccated scale-like squamules of Placidium are dark brown most of the year. After sufficient rains, the thallus turns greenish. 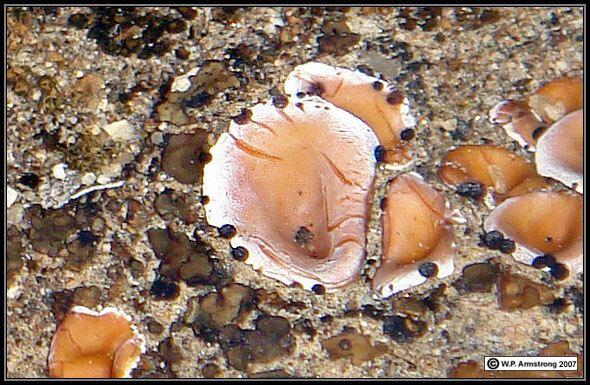 Another genus of soil lichens commonly associated with cryptobiotic crusts is Collema. They are called jelly lichens because the thallus becomes gelatinous when it imbibes water after rains. Cryptobiotic crusts are very beneficial because they hold soils in place and protect the underlying sediments from erosion. They are also an important pioneer stage in succession on bare ground (xerarch succession), thus enabling grasses and herbs to become established. Placidium lacinulatum, a squamulose soil lichen commonly associated with cryptobiotic crust in Anza-Borrego Desert State Park. The thallus is composed of small, brown, scalelike squamules. The spore-bearing perithecia are embedded in the thallus. 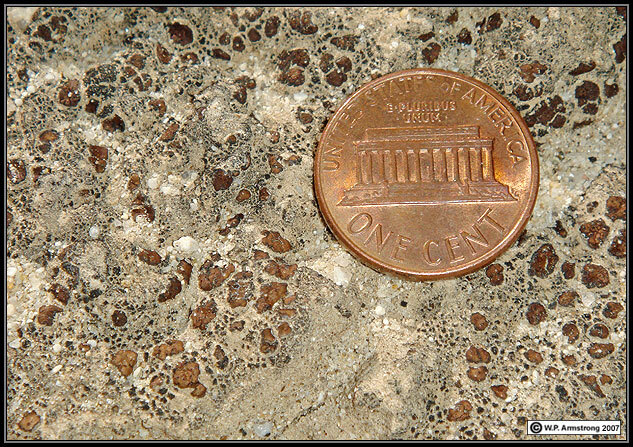 Center: The black, granular, tarlike area is a foliose, cryptobiotic soil lichen. Some of its characteristics resemble the genus Collema. 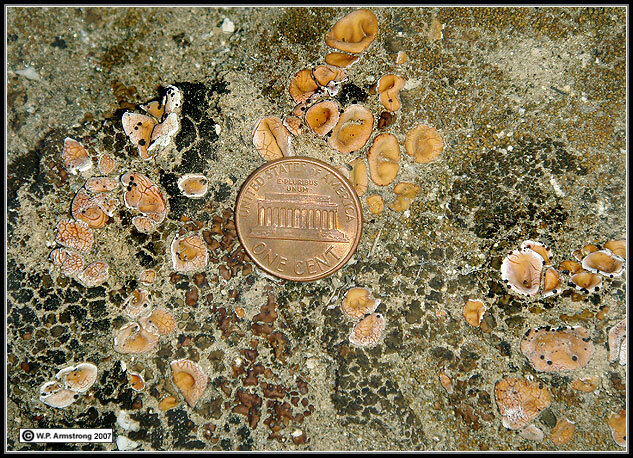 It is surrounded by the brown, scalelike squamules of Placidium lacinulatum. 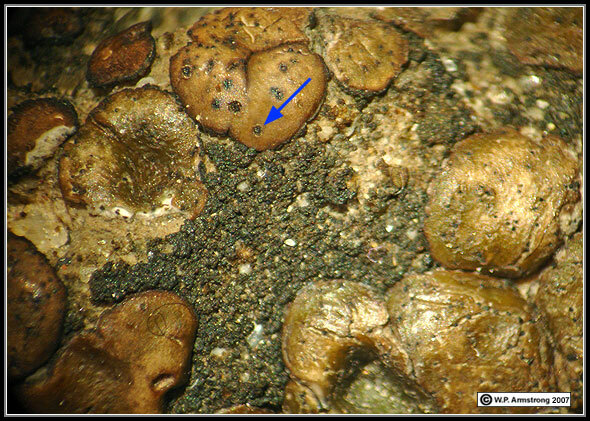 In Placidium, the spore-bearing perithecia are embedded in the thallus (blue arrow). Magnification 10x. 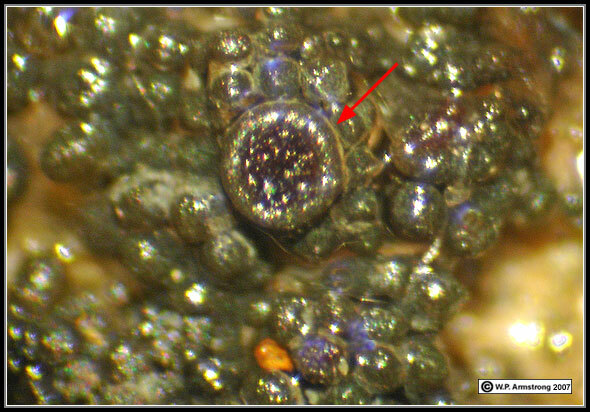 Magnified view of black soil lichen showing apothecium (red arrow) and abundant spherical isidia. Some of the characteristics of this foliose lichen resemble the genus Collema. Magnification 30x. 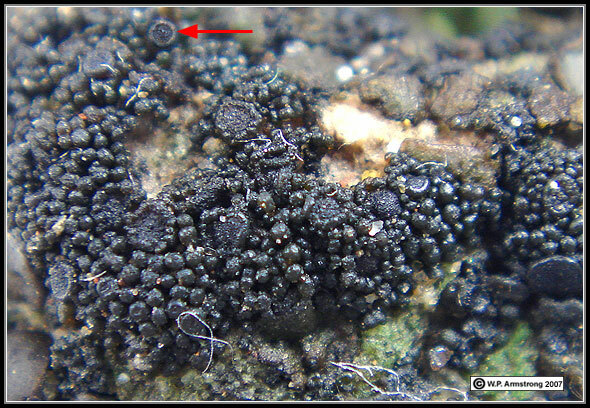 Close-up view of apothecium (red arrow) of a black soil lichen. Some of its characteristics resemble the genus Collema. The minute, lecanorine apothecium (margin same color as thallus) is about 0.6 mm in diameter. The thallus is composed of numerous, minute globular lobes (isidia?) that imbibe water and become gelatinous and greenish-black. Magnification 60x. Magnified view of a black soil lichen showing a portion of the hymenial layer from an apothecium and scattered filaments of a cyanobacterium (presumably Nostoc). Some of the characteristics of this foliose lichen resemble the genus Collema. 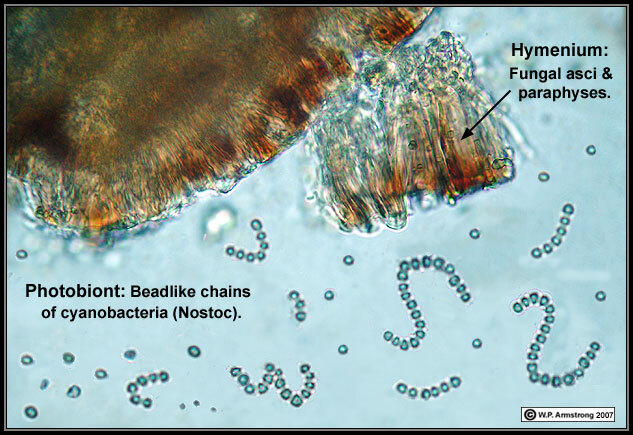 The Nostoc filaments fragment into numerous individual cells under the cover slip. 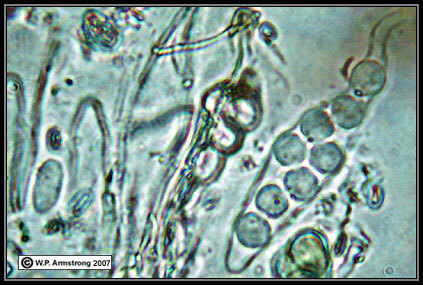 Some filaments show the cellular sheath typical of cyanobacteria. Magnification 600x. The left image shows an ascus from the above apothecium that contains 8 colorless ascospores. Spores of Collema are typically septate. Perhaps these spores are immature. Some of them appear to have a faint septum. Magnification 1000x. 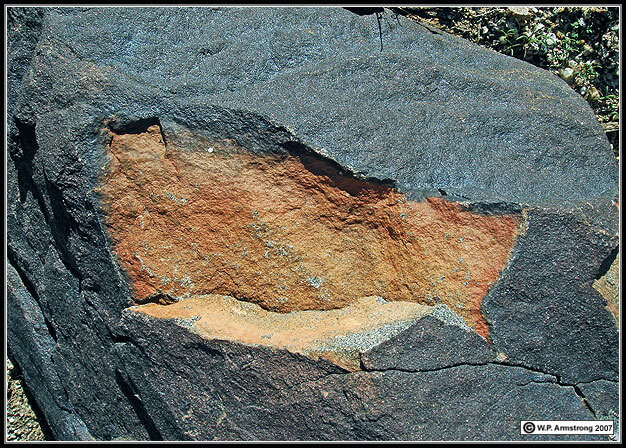 Psora decipiens, a squamulose soil lichen associated with cryptobiotic crust in Anza-Borrego Desert State Park. 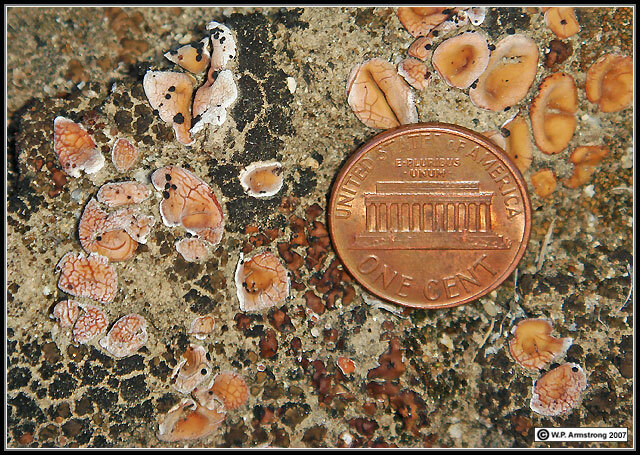 The thallus is composed of orange-brown, scalelike squamules. Individual squamules develop a white margin with several black apothecia. The smaller, darker brown squamulose lichen is Placidium lacinulatum, another indicator of cyptobiotic crust. The black areas to the upper left of penney is yet another minute soil lichen of the genus Collema. Close-up view of a scalelike squamules of Psora decipiens showing white margin and several black apothecia. The smaller, darker brown squamulose lichen is Placidium lacinulatum, another indicator of cyptobiotic crust.